ACOUSTIC EXPO 2014: Beverley Martyn might not be a household name, but to fans of British folk she's practically royalty. As the wife and musical partner of John Martyn, Beverley co-wrote and recorded the classic folk rock albums Stormbringer! and The Road To Ruin. The Phoenix & The Turtle is a great sounding album. Are you pleased with how it's turned out? "Well, I'm very critical of whatever I do. I tend not to listen to it too much. I'd just pick it to pieces. It's hard listening to your own vocals, but the musicians are great. I'm very proud of what I've done and all the work that Mark [Pavey, producer] has put into it. I didn't think at this stage of my life, at my age (6) I would see this album coming out. It's a bit dreamlike." Can you tell us about the song Reckless Jane that was co-written with Nick Drake? "It happened when Nick was round on one of his unannounced visits, and I was there with the children and the little girl from next door. I had written a song based on someone called Reckless Jane. I started singing it and the little girl from next door's mother was called Jane, so she said, 'Is that about our mum?' I said, 'No, but it could be! You never know…' I said, 'It's a way of disguising the person. The poets used to do that, like WB Yeats.' I didn't say, 'Nick Drake does it, you know, with Hazy Jane and Mary Jane…' And Nick started laughing. I was toying with him, trying to bring him out. "So I started singing, 'Reckless Jane…things will never be the same.' And he shouted out the next line: 'She would do it all again!' So we went on and other lines were coming, like 'See her running down the lane', or 'running in the rain', which is typically Nick. Then we left it alone until about 12 years ago when I saw Jeff Beck at the Nick Drake tribute at the Barbican and he said, 'You must finish that song.' So I finished it and sang it." "When you listen to someone's music and watch them perform, you're looking into their soul. It wasn't just the physical thing [with John], it was all that going on"
Did you have a similar way of writing with John Martyn? "No, it was John writing the guitar part and then me coming up with a melody and lyric. It wasn't work - we were having fun. John really loved to play. That was his joy until he was too ill and wasn't enjoying it anymore, really. But he was full of music when I first met him." "I met John in 1968. [American folk musician] Jackson C. Frank asked me if I would go to see a guy called John Martyn at the Chelsea College of Art folk club and said, 'And bring your guitar! They might want you to do a song.' So I went along, saw John and then I did a song or two. I met him afterwards and he seemed like a very excited schoolboy. He was so young - pretty and very hippy-fied with his silk shirt and long, corkscrew curls and really piercing turquoise eyes." Was your connection a musical or romantic one in the beginning? "Well, it was both. When you listen to someone's music and watch them perform, you're looking into their soul. It wasn't just the physical thing, it was all that going on [too]. I thought he was very talented. He was a guitar magician, and only 19. So I married him when he was very young." What was it like being married and also having what must have been a pretty intense musical relationship? "Oh, well it was up and down! But then it got so bad that there wasn't any music any more. I was distancing myself because he was like two people - Jekyll and Hyde. When he was nice, he was really, really nice. When he was bad… It was that part, when it went too far, you know, 'This is dangerous, this guy's dangerous. I've got to get away from here.' And that was with drink and chemicals. "I think he'd been hurt as a child, his mother giving him to his father to look after in Glasgow. He pretended that that didn't hurt him but I know it did. I think that's where his mistrust of women came from, because it wasn't just me, it was all the other women he had relationships with. He had this nasty, misogynistic side that was very violent." Is Levee Breaks a tribute to your first band, The Levee Breakers? "I think I heard Memphis Minnie's version and that's when we started the band, when I was about 16 and recorded with Parlophone/EMI. So yeah, it is a tribute to my boys who have all gone now. I'm the only member left. They've all passed on." "Thank God it is! [Laughs] It's my version. 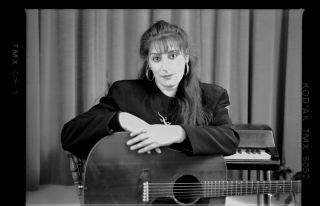 When I started it, I dropped the E string down to D. I originally played it with just an acoustic and then of course the magic of being in the studio, you can do anything." "The guy who taught me to pick and to play a 12-bar blues was Bert [Jansch]. He said, 'You picked that up quickly! You'll be good at it. Just stick at it'"
You worked with Jimmy Page and John Paul Jones on one of your first singles, Happy New Year. What do you remember about that? "Denny Cordell [Martyn's manager at the time] used them because they were the session musicians of the day. The songs had all been worked out. Jimmy took my basic picking and turned it into rock, especially on the B-side Where The Good Times Are. I didn't have anything to do with that, I just had to deliver a vocal. "It was great working with them and Jimmy was very sweet then. He wasn't the 'dark lord' - he didn't even smoke or drink. He was asking me about my guitar playing and I said I'd had a lesson from Bert Jansch, who he hadn't heard of then." Is it true Bert Jansch was your first guitar teacher? "Well, the first guy to teach me a few chords was Johnny Joyce, the guitarist in The Levee Breakers. But the guy who taught me to pick and to play a 12-bar blues was Bert. He said, 'You picked that up quickly! You'll be good at it. Just stick at it, keep playing.' So I did." Beverly Martyn's album, The Phoenix & The Turtle, is out now on Les Cousins Music.